Charles Shamess is the Director of the Evidence-based Practice Unit at the Ontario HIV Treatment Network, Canada. He has a long history working and volunteering in the AIDS movement in Ontario. He has been part of numerous committees and strategies addressing HIV prevention in Ontario and helped to promote the use of evidence-based programs and evaluation practices. He came to the stand to say that he 'loves' aidsmap.com. He visits it regularly and frequently sends information from the website out to his staff. He gets HIV weekly, NAM's free weekly round-up of HIV research and developments and often pulls articles out for discussion and consideration with his teams. Charles recognises that there is "so much information out there it is often hard to know what are the sources you can trust". He feels he can rely on aidsmap as he knows it is up to date and easy to use, and this makes it easy to pass on to others. To find out more about the Ontario HIV Treatment Network visit www.ohtn.on.ca. 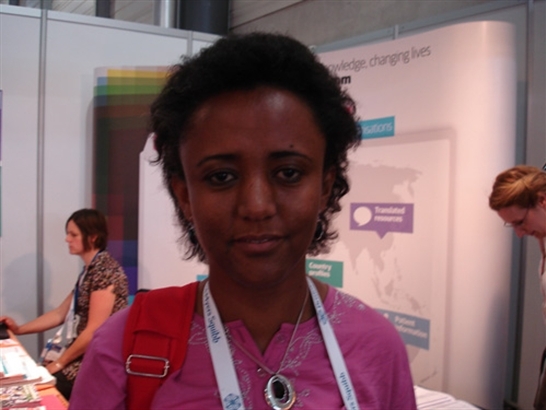 Eyesusawit is a physician working in Ethiopia and came to say hello at the stand on the second day of the conference. She came over to tell us that she loves the patient information booklets and the basics leaflets and always gives them out to her patients. She finds that these resources are especially helpful for people who have just been diagnosed and those that are starting treatment. Eyesusawit explained that the booklets are so useful because they are written in simple language and are really easy to understand. Patients take them home, read them in their own time and then come back to her with any questions they might have. Feliciano is the president of Accion Solidara which is an HIV organisation based in Venezuela. 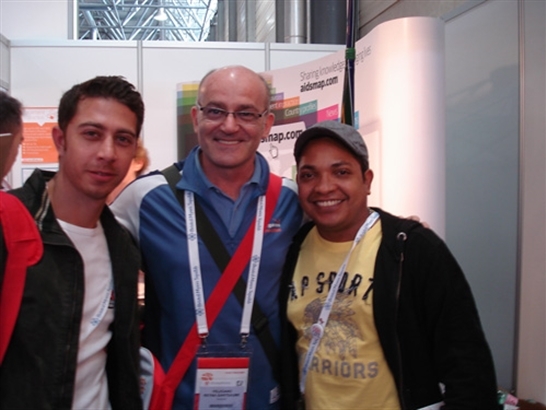 He came over to visit our stand on the first day of the conference along with two of his colleagues, Cesar and Jesus. Feliciano came over to thank all the team at NAM for the "extremely valuable" variety of information that he receives from the website which helps him in several different areas of his work. The organisation hosts the ‘National AIDS Helpline’ in Venezuela and uses information from aidsmap.com as a reference to answer a diverse range of calls from people living with HIV both in Venezuela and other Latin American countries. People often ring the helpline for information on where they can access treatment in their country or the country they plan to visit or emigrate to. Feliciano and his team use the 'E-atlas' organisations listing on aidsmap to refer people to HIV organisations in-country that will be able to help them. Feliciano also writes a weekly column for a newspaper in Venezuela on the topic of HIV called ‘HIV Alert’ and within the column often refers to news articles sent to him from NAM that he has found interesting. 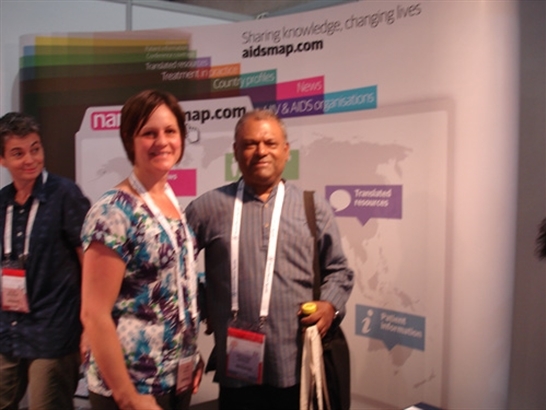 Dr Abdool from the UN visited the NAM stand. He oversees a huge network of NGOs working in HIV and AIDS across Kenya. He let us know that he uses the information booklets and takes copies to give to his NGO networks. The materials are easy for NGO staff and people living with HIV to read and understand. Information about HIV and AIDS is vital. He thinks people are desperate for good information and there should be more and more ‘we all must do everything we can’. Lipodystrophy is a key issue for people living with HIV in Kenya. NAM has a huge range of information on this topic and talking to Dr Abdool reminds us that, although in the UK lipodystrophy is no longer a common side-effect, in different parts of the world it is still a major concern for people living with HIV. Dr Abdool has given permission for us to contact him again to get further feedback about NAM's resources and how they are used and any gaps in information that we can help to fill. This frank feedback is invaluable to NAM, visit our about us pages to find out how your feedback helps us. Dr Adams has been an HIV doctor for over 23 years. Based in Brazil, she now works for Projeto AMMOR (www.ammor.org.br), a non-governmental organisation, for people living with HIV. With her HIV medical background, she brings a special contribution to the organisation as she can help explain HIV and AIDS, and subjects like drug resistance and undetectable viral load to the people she is supporting. She also helps advocate for access to treatment, often writing medical reports that will be presented to a judicial panel by their human rights lawyer. "Judges aren’t doctors so you have to put the case in clear language so they can understand it", she says. Irene finds the NAM resources invaluable – she took copies of the drug chart from the stand and she will give them to each of the project workers. Irene has a good way of checking the information she is giving out is being understood. When she runs groups she lets people ask questions – and others in the group answer them. That way she can see what is being learnt or not and make sure people understand the key issues. The best way of testing you have understood something is to try and explain it to someone else. Alex runs a comprehensive health and wellness programme including testing, education and prevention. The key challenges relate to wider social issues such as stigma and misconception about HIV and AIDS. With a diverse workforce comprising of people with different religions, languages and cultures, it is difficult to find a single thing that can work for everyone. Dr Govender packages information, tailoring it to different people’s needs. He finds the NAM resources useful – at last year's conference, he took leaflets from the basics range and NAM booklets and handed them out and made copies for the entire workforce. Dereje used to work at Addis Ababa HIV/AIDS Prevention and Control Office and now works for Ethiopian Public Health. 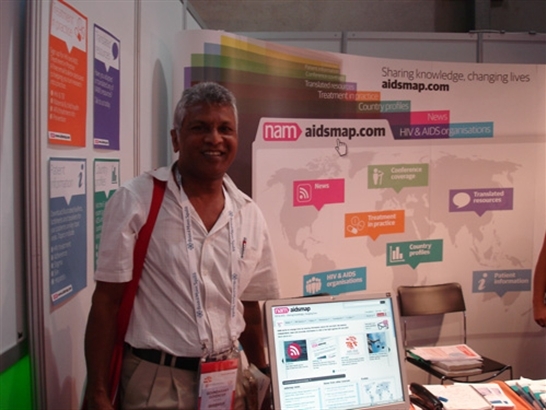 He still uses NAM materials and said aidsmap.com is one of the most useful resources that they use regularly. Collaboration and sharing has been important to the work of the Prevention and Control Office. 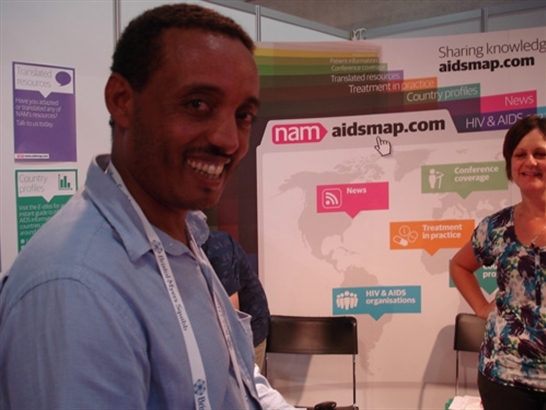 He used NAM’s HIV and AIDS Services Worldwide, a database listing organisations working in HIV all over the world, to help him connect with organisations in different countries. He built his own networks with organisations in Senegal, India and Botswana so they could learn from each other’s experiences and share information and ideas. Take a look at the 'E-atlas' today - is your organisation on the map? Get in touch with e-atlas@nam.org.uk, and she will make sure you are. AMREF is an indigenous African organisation. They train health workers across Africa. The team ‘distil’ information from reputable and recognised institutions and send out monthly bulletins to their networks. One of the big challenges is getting information to those health workers who badly need it, but have no access to the internet. AMREF will often download information on to CD-Roms and send them out into the field. This way useful information can be used in remote field hospitals, which have a computer, but no access to the internet. Nicholas lets us know that they often use NAM and aidsmap as a source of useful information. The small information booklets are useful for health workers as well as lay people and can be used as a guide to complement other in-country resources. 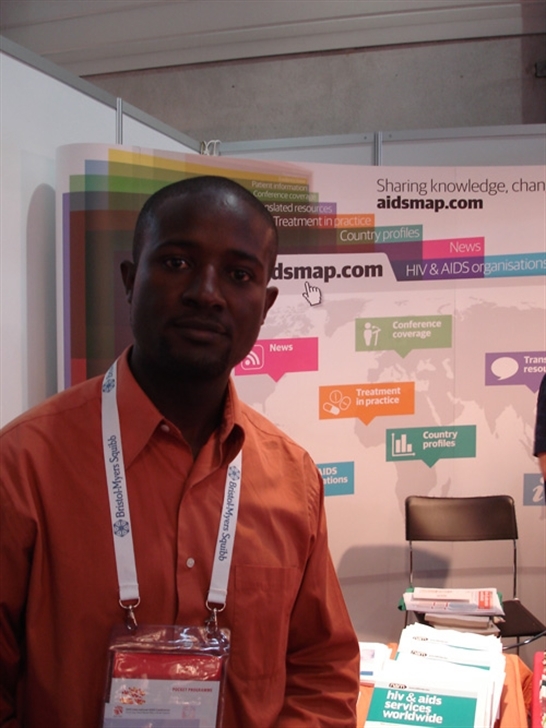 The AMREF website hosts an RSS feed from aidsmap.com. This free news feed means they can make sure their networks have the latest information with quick summaries and links to the main articles for further reading. You can add an RSS feed for free to your website by following this link - simply follow the instructions. AMREF are also exploring ways of using cellphones to communicate important health information to rurally isolated clinical officers and nurses. Dr Oladokun works with children who have HIV and TB; she also teaches and trains other medical staff. 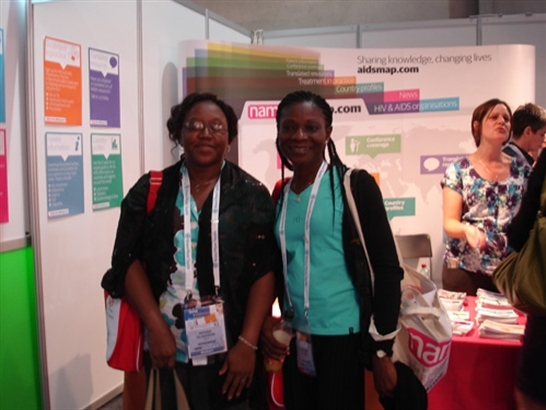 She signed up to the HIV and AIDS Treatment in Practice (HATIP) at the last IAS conference in Cape Town. She has been getting regular correspondence from us ever since, which she has found very useful. The topics she particularly looks out for are TB, infant feeding and treatment in children, all of which have been covered in HATIP. She also finds the conference coverage on aidsmap.com useful, with its reports on the outcomes of important meetings from round the world. She saves relevant articles in a folder to refer back to and often uses it as a guide when she is preparing a training session. She mentioned that the guidelines on treatment in children are changing and she looks forward to reports on how to implement these guidelines. During the conference, aidsmap.com has teamed up with UNICEF to give specific, focused coverage on HIV in children. Make sure you are in the loop by signing up to HATIP and the conference e-bulletin summaries today. The New Zealand AIDS Foundation works with both HIV-positive and negative populations. Their activities include HIV and STI testing, and providing support services for people with HIV through counselling, psychotherapy and social work. Eamon is also the treatment officer for New Zealand, and the international co-ordinator for the candlelight memorial for Australia, New Zealand and the Pacific Islands. 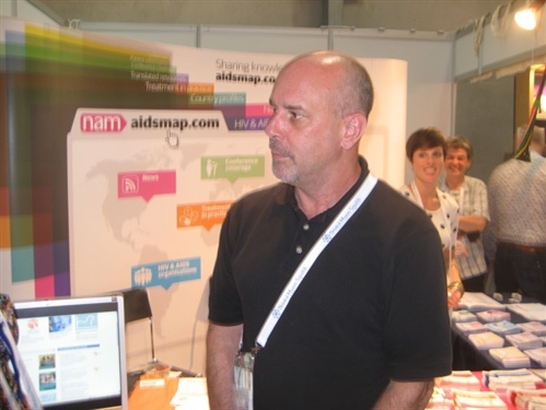 Eamon uses aidsmap.com to keep up to date with the latest research and to develop materials to train staff in providing support to people with HIV. 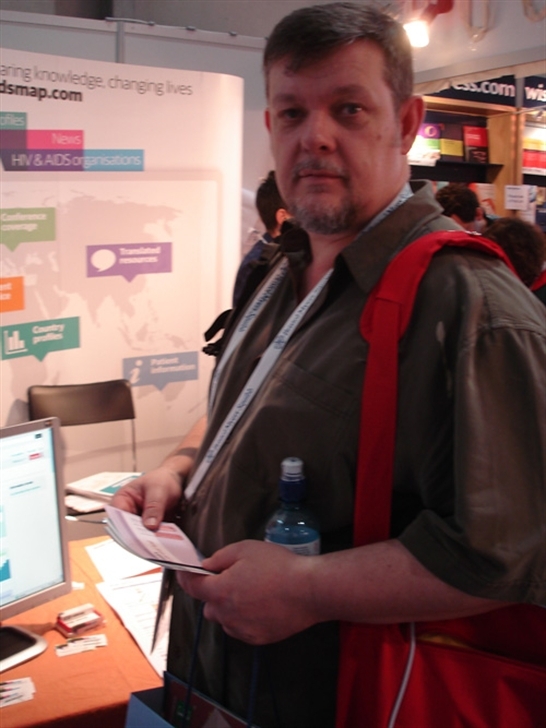 He came across the basics for the first time whilst visiting NAM’s stand (502) in the exhibition centre at AIDS 2010, and will use them to complement his resource HIV & AIDS – the beginners guide. Ejimole is a nurse by profession, and founded the World Youth Peace Organisation. Their headquarters are in Nigeria, and they have a base in both Iraq and Palestine. They work with youth groups, and women and children around issues including HIV and health education. 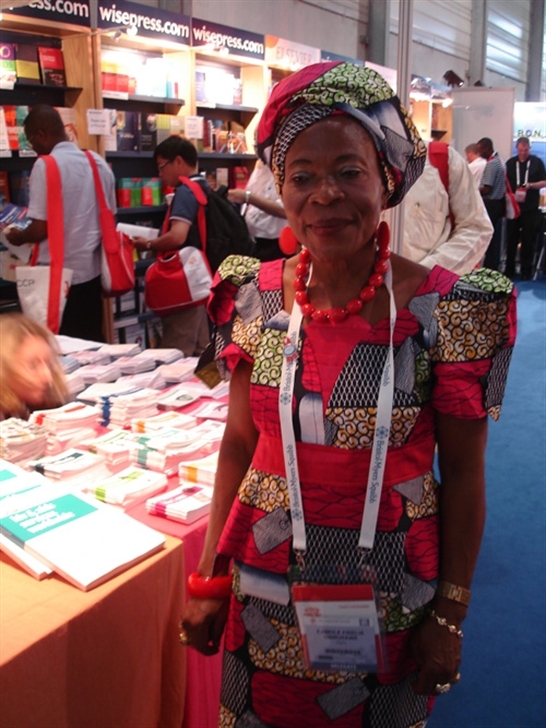 Ejimole uses NAM’s booklets to support her work with people with HIV. She was excited to find NAM’s resource HIV & AIDS Services Worldwide and will use this to grow the network of her organisation. Paula works as an Advocacy Coordinator at the AIDS and Rights Alliance for Southern Africa and delivered a plenary speech at the Vienna conference. 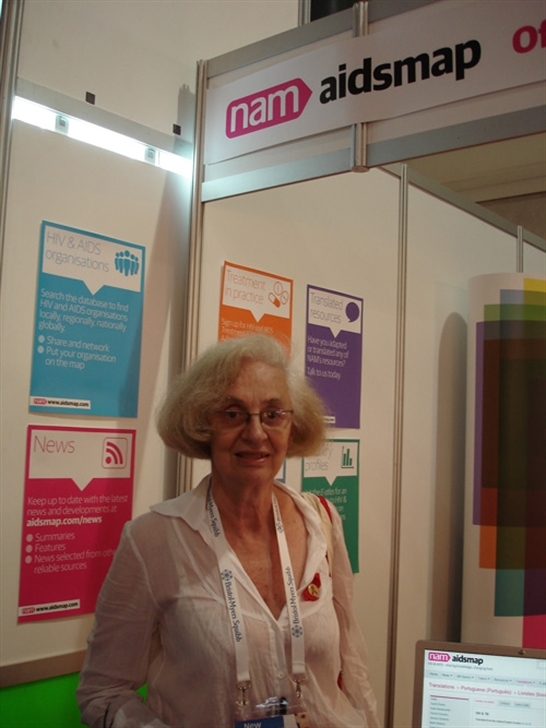 Paula considers aidsmap a valuable resource to their organisation and a good way of keeping up to date with the most current developments in the sector. She finds the news articles particularly useful as they condense huge volumes of scientific information, that she doesn’t always have the time to read through, into a few hundred words. Sign up here to receive NAM's news straight to your inbox so you can keep up to date with the latest developments. She also finds the information on aidsmap easy to understand and this is useful in a training capacity, as people that join her organisation sometimes do not come from a scientific background. 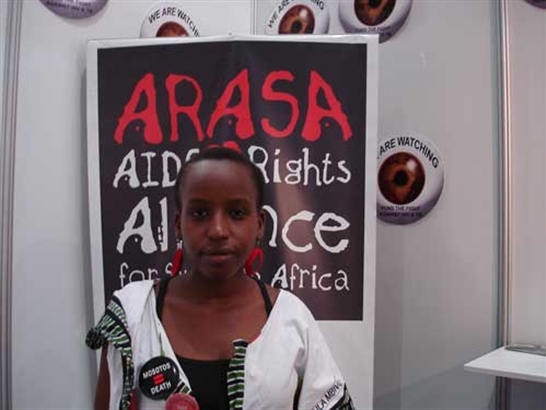 Reading information on aidsmap has enabled them to become engaged in the work that ARASA does, despite not having had previous experience with scientific topics.